The Absolute Highest Horsepower Handling Overdrive you can buy! Gear-Splitting Performance and Overdrive Economy. For RV’s, Trucks, Muscle Cars, Hot Rods, and Racing. The Finest Quality Auxiliary Transmissions. The Ultimate in Horsepower Handling and Performance. GEAR VENDORS provides overdrive product to racing cars and trucks up to 2000hp and trucks towing heavy RV’s up to 25,000lbs gcvw. Whether you are trying to move a couple tons up a steep incline or moving just a couple thousand down the track â€” the fastest way is with the right gearing. Add the benefits of a final overdrive ratio to reduce engine rpm and increase fuel mileage by typically 20-28% and you have a product that is the single biggest innovation you can bolt to your car or truck. With fuel costs high the overdrive can pay for itself in mileage and engine wear reductions. That makes the driving pleasure of overdrive, and performance improvements free â€” and then the vehicle is also worth more when/if you ever sell it with the GEAR VENDORS. In the long run it just doesn’t cost you anything to own a GEAR VENDORS UNDER/OVERDRIVEâ„¢. For an in-depth discussion on which vehicles can expect these mileage gains see our “common questions” section on the web site. Torque (times) RPM (divided by 5252) = Horsepower (this can be expressed) Tq X RPM / 5252 = HP. GEAR VENDORS is one of few products that can work both sides of this equation for real performance gains as well as consistent fuel consumption reductions. Gears are multipliers of torque and our Ratio Splitting capability allows you to shift to a gear with more mechanical advantage than the next stock gear in automatic transmissions and wide ratio manuals. This also means engine rpm drops about half what it did without the GEAR VENDORS and so rpm is sustained – higher torque and rpm on shift = more HP. And then shift to an overdrive final and reduce both rpm and torque to reduce the manufacture of HP when steady cruising to improve fuel mileage and decrease wear on the engine and engine driven accessories. 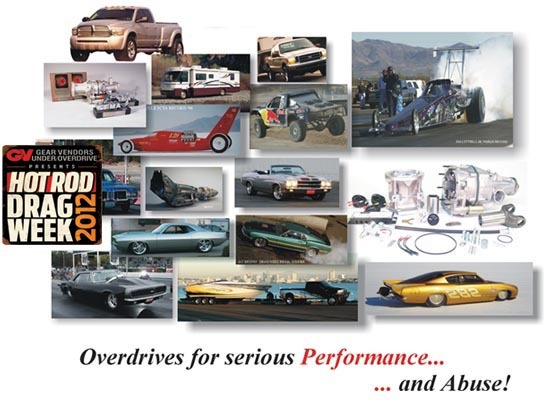 2 world records in Drag Racing, 4 Off Road Racing Titles, and several Land Speed records all benefit from GEAR VENDORS ratio splitting performance. At the same time this ratio splitting makes less work for the main transmission in the vehicle to then advance to the next gear (less ratio change) and thus the main transmission itself becomes more reliable. This is a great benefit at the track or on the highway. Whether your interest is motorsport or recreation â€” you cannot buy a more proven product. OEM means that new vehicles have come factory equipped with GEAR VENDORS as original equipment. When GEAR VENDORS first started producing the DeNormanville planetary overdrive in 1979 there were no American vehicles with overdrive. 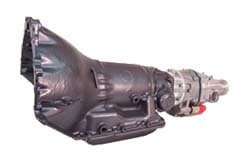 Only the import cars with manual transmissions had an overdrive gear. Through the years we have worked with Ford, GM, and Chrysler and our products have come factory on everything from one of Americas fastest production cars (GM’s TwinTurbo Callaway Corvette) to Americas largest RV manufacturer (Fleetwood Motorhomes). In 1981 we won our first Best Engineered award from SEMA (the largest automotive aftermarket organization). 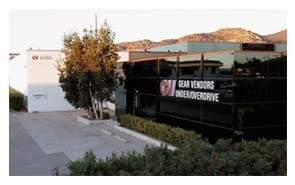 GEAR VENDORS is without question the most awarded and recognized aftermarket transmission product. GEAR VENDORS has been manufacturing overdrives for 27 years. We have been reducing fuel emissions on the most powerful and fuel consuming gas and diesel vehicles for nearly 3 decades before Green House gas emissions became the buzzword they are today.GEAR VENDORS equipped vehicles are responsible for reducing emissions nearly 25% in the average application compared to the non-equipped stock counterpart. With nearly 75,000 units in service we are reducing tons of emissions per day. Whether your purchase of our product is for a brand new diesel truck or a 1960’s muscle car it is nice to know this performance product can substantially benefit the planet and our countries oil dependency. Related to fuel economy, performance, and emissions â€” GEAR VENDORS overdrive kits include electronics that keep the vehicle in the optimum performing gear. Whether you are driving a older non-computer controlled vehicle or a late model with all the latest emissions computers our electronics provide the interface to ensure maximum performance and correct rpm without lugging or overreving in the wrong gear. The OE factory programming remains intact and our processor just makes it aware of the actual ratio 1,000 of times per second. In older vacuum or throttle linkage transmissions the stock governor on the output shaft instantly slows down the moment the overdrive shifts and so automatically moves the shift point in any overdrive gear up by the correct 28.6%. So both electronic and non-electronic automatic transmissions gain a group of features including a passing gear or climbing gear that is automatically available without driver intervention and is at the split between 2nd and 3rd where you really want it. Electronic options also exist for racing and performance use such a paddle-shifters with our programming already installed by companies like MasterShift, and our AutoShift Sequencer that can work with stock and aftermarket shifters just like many of the race teams use. Our standard AutoDrive electronic however do include several great features for a combination of street/strip use including AutoLaunch for both manuals and automatics. GEAR VENDORS makes the highest quality, most expensive overdrive you can buy. We back that with customer service and warranties you do not commonly find in business today. Call us at the factory and you will talk to real enthusiasts that know drivetrains. Our factory people will ask you the details of your vehicle and its use and then recommend our product only if it is going to be exactly what you expected and give you great benefits in your application (which is exactly why we can give a money back guarantee). These factory reps can give you the details of installation and use and send you photos, diagrams, and brochures for free. If you are installing yourself we will ship product direct to you with full factory support. If you would like to have one of GEAR VENDORS 500 nationwide dealers install the product – we will make sure to communicate with the local dealer and get your exact product in his hands for the install day. All or products come with a money back guarantee and a 2 year unlimited mileage warranty (except diesel manual truck and commercial applications see warranty for details). Last but not least â€” we do not show pictures of racing and then deny your warranty if you race (hard to believe so many companies do just that). All GEAR VENDORS warranties cover you on the street and at the track (though we do require a contingency decal for pro users). Call us at 800-999-9555 and ask for “new product customer service” – get the kind of service you thought was left back in the 60’s.